SAC minimizes downtime through preventive maintenance and a fast, skilled response to any problems or concerns. With a back-up power solution from SAC, you can be confident of system integrity  and security. Through decades of experience, SAC has developed a trouble-shooting approach to maintenance that makes sure that if your primary source of power is removed, your back-up system works reliably and at full power. The SAC methodology virtually eliminates the risk of system power loss while providing the data needed to keep components running smoothly and cost-effectively. These regular reports also enable you to be proactive in planning  and budgeting  for system upgrades. Far better than quarterly maintenance check-ups, SAC's ongoing monitoring systems detect under-performing cells before they compromise back-up power or operations. SAC's standard maintenance and testing program is the most thorough in the industry  with more scheduled visits, more in-depth testing, and more detailed data and performance reporting than any other provider. The standard quarterly maintenance checks recommended by battery manufacturers provide a snapshot of battery status at the time of the testing. SACGuard systems go a vital extra step, providing the full-time monitoring required to measure the integrity of the battery via the cell voltage and deliver full-power performance whenever it's needed. Unlike individual biasing systems or single calibrated data-acquisition meters, SACGuard systems can monitor up to 240 cells (measurements are per 12-volt blocks). This is a vital distinction since multiple cells must be connected to provide adequate back-up support time and adequate voltage for operations. The cascading design handles cells connected "in series" and stacked "in parallel" to reduce the cost and boost the efficiency of battery monitoring. By using quality relays and controls, SACGuard systems provide a low-resistance copper path for voltage measurements within 1mVDC accuracy. These measurements are regularly recorded and a running average is stored, along with time-stamped high and low readings. With SACGuard monitoring, performance corrections can be made in time to prevent catastrophic failures. In addition, early detection of problems can allow questionable cells to be replaced  preventing expensive replacement costs. Design. 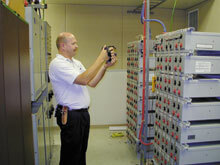 SACGuard systems run continuous scans of battery cells to detect any dangerous variations in cell voltages. During installation, connections are made between each battery cell and the corresponding relay via a fuse board designed to prevent accidental cross connects. The "cascade" design of the switch board also prevents multiple relay activation. Custom control. SACGuard systems use Z180 microcontroller technology to control custom switching circuitry, modem, and data acquisition devices. The Real-Time Clock provides an accurate time stamp for measurements. Accuracy. A 12-bit, optically isolated, analog-to-digital converter provides measurements that are accurate to one millivolt. While readings are constantly acquired, an average voltage value is obtained from the readings and uploaded to the Internet on a user-defined schedule. The reports also include time-stamped "highest" and "lowest" readings. By monitoring cell voltages continuously to the millivolt level, statistical trend analysis can then identify cells which may require attention before a failure. Strategic value. Once data is uploaded, it can be viewed and retrieved from any authorized computer with Internet access. In addition, users may set readings parameters that trigger SACGuard to provide emergency paging and e-mail notification so prompt intervention can be made. Entering a User ID=Test and Password=Data. By integrating infrared imaging with regular maintenance and monitoring, SAC protects your system against costly "hot spots." 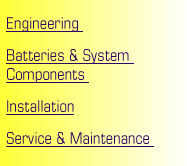 Thermography, a service provided by SAC, adds a vital extra layer of protection to your system. Using patented thermoelectric imaging technology, SAC takes infrared pictures of your power room that reveal "hot spots"  before they lead to expensive damage or a catastrophic system failure. Thermographic imaging detects "hotspots"  battery heat which can lead to thermal runway and eventually destroy the battery. This imaging also detects cable heat caused by either undersizing or overheating in UPS systems. Using an infrared imaging camera, SAC incorporates hot-spot monitoring into its program of predictive and preventive maintenance. The camera  used by a technician  provides a real-time thermographic sweep of the power room and crisp infrared images, complete with temperature data. The data can be analyzed instantly, or stored with images on a memory card. If hot spots are identified, prompt action can be taken to eliminate problems  and risks. SAC collects and analyzes thermographic data  in time to take corrective action to protect the ongoing reliability of your back-up power system. SAC can respond to critical situations by putting service technicians in touch within just 2 hours of your call  most routine problems are resolved within 24 hours. Full back-up protection for a client was restored within just 3 hours, thanks to a barcoded inventory system for spare batteries. A problem at an SAC installation in Korea was handled in just two days. "Your very quick service restored the battery back-up system to full power ..."
Service is available in all 50 states, plus locations worldwide. Skilled technicians have factory training on your system components and attend refresher training on new service techniques, developments, and safety procedures. Extensive parts inventory, with each service vehicle carrying an on-board complement of service materials needed to make the vast majority of repairs  on the spot. In addition, SAC can tap regional and national stocking locations to provide around-the-clock access to parts, with same-day or next-day delivery. All replacement parts are new or certified "like new" by the OEM. On-call technical support gives technicians 24/7 access to senior SAC technicians and manufacturer engineering staff  so complex problems can be resolved quickly and with expert results.